After breakfast you drive downstream along the River Indus on Leh – Kargil Highway. 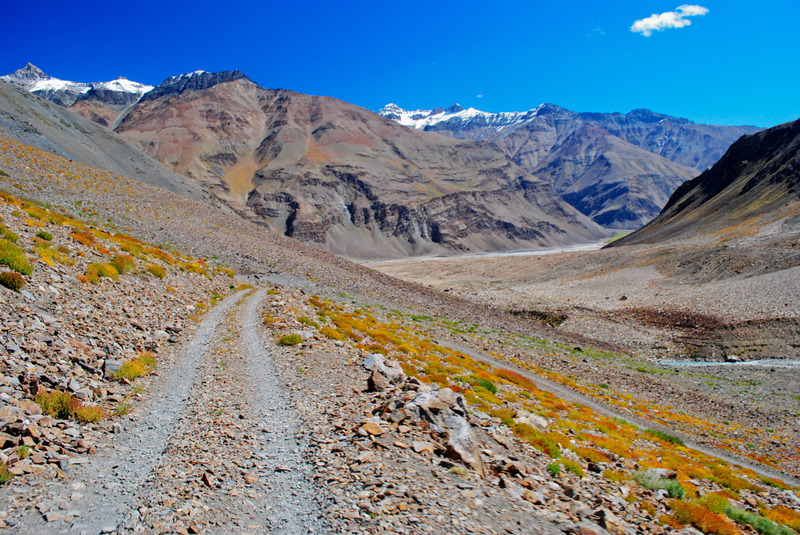 And start our sightseeing with Magnetic Hill which defies the law of gravity & further Driving through a picturesque landscape we reached the Confluence Of The Indus And Zanskar River. After visiting above places we drive further to Alchi Monastery over a century old, its wall paintings are very similar to those of the Tabo gompa in Spiti, Himachal Pradesh. Unlike other monasteries, which are usually on a cliff top or cling to a mountainside, Alchi is at ground level and is nestled in the shade of a garden. Overnight in West Ladakh Deluxe Camp, Uleytokopo with attach bathroom. After Breakfast drive to Nubra Valley via Khardungla (Highest Motorable road in the World, 18,380 ft) post lunch, enjoy the camel safari at Sand Dunes between Deskit & Hundur Village. Nubra valley is also known as Ldumra means the valley of flowers, two centuries ago it use to be the hub of silk route trade, to go to Kashger, and Khotan till Rome with laden two humped camels with indian tea and other herbs from india and silk from china. the view is more and more magnificent further toward Panamaic village. After 250 km you reach the world most expensive battle ground the Sia-chen glacier bordered between Indian and Pakistan (still it fall under restricted are and tourist are now allowed) O/N Nubra Valley. After early Breakfast leave for Pangong Lake (14,500 E) through Changla Pass 17,350 E, 3rd highest motorable road in the world. Enjoy the beauty of the lake on the Banks of pangong while appreciating the changing Colors and fascinating high altitude of the Lake. Upon arrival we check in at our Camp Near Pangong lake. Overnight at Pangong. Morning at leisure to explore the beauty of lake and later we drive back to leh and check in at Hotel. Day sightseeing to the 800 year old Thiksey monastery and the huge Matriya Buddha statue, the famous Hemis monastery and museum and The Shey palace. O/N in Leh.